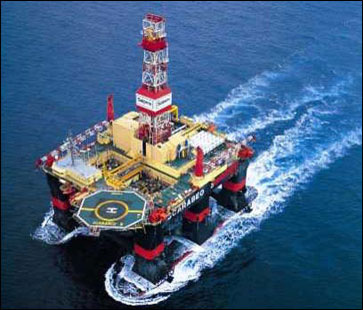 It has long been known that some of the largest reserves of oil and gas lay below the waters of the world’s oceans. For the last several decades the relatively shallow coastal waters have been the center of activity to locate and extract these reserves. Until the last few years, the limitation on how deep underwater a reserve could be tapped was the ability to build a fixed production platform structure tall enough and big enough to reach the ocean floor. This limited production to water depths of no more than a few hundred to just over 1000 feet. That is no longer the case. The invention of advanced subsea production systems, remotely operated vehicles (ROV’s) and floating oil and gas production facilities have now pushed the limitation on water depth out to the 15,000-foot mark and beyond. Accurate flow measurement of a variety of fluids used in these subsea production systems located on the ocean floor and on the ROV’s used to service them at these extreme depths is critical to their proper and safe operation. Measurement applications include specially formulated hydraulic control fluids, drilling mud and seawater. 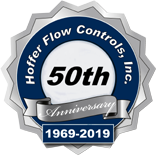 Hoffer Flow Controls is a leading supplier of highly customized subsea flowmeters to meet the extreme conditions associated with working at depths to 15,000 ft or more. 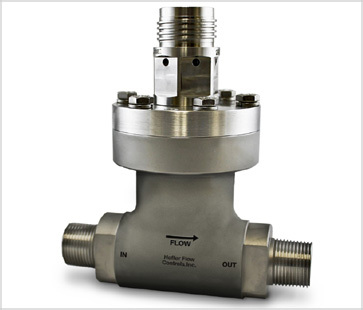 In addition to high internal operating pressures of 15,000 PSIG and more, the meters must withstand high external pressures created by the sea. These pressures can reach as much as 5000 PSIG. The temperature of the seawater to which the meters are exposed is often well below 32° F (0° C). The salt content of the seawater prevents the water from freezing but still reduces the strength of metals which must be taken into account. The need to transmit the flow signal to a remote input control device, either located subsea or on the surface aboard the production facility, requires the use of specialized electrical connectors to permit wiring interfaces. These connectors are often welded to the top of special risers that enclose the meter coil (See Illustration 1). This coil riser enclosure must also be able to withstand the high external pressure exerted by the sea and remain watertight. Above all else, however, the flowmeters must be exceptionally reliable. Day-in and day-out the flowmeters must function accurately and reliably at these depths without routine servicing or maintenance When a subsea system has to be serviced, it is a logistically complicated and financially expensive operation. Though scheduled servicing is required on the systems; an unscheduled service call due to a flowmeter failure is simply not acceptable. The extraordinary reliability of Hoffer turbine meters under these conditions has made them the preferred choice for many subsea system manufacturers. Pictured in Illustration #2 is one of three custom-designed Hoffer 5” flowmeters recently built for use on a new subsea drilling fluid return lift system for operations at depths to 10,000-feet and beyond. These are perhaps the largest turbine meters ever built for operation at these depths. The meters feature a proprietary high-pressure clamp-type end fitting specified by our customer. They are rated and tested to internal and external operating pressures of 9,000 PSIG. 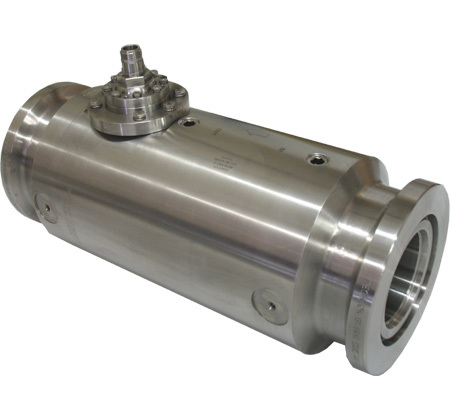 The main meter bodies were machined from single-piece Duplex 2205 stainless steel. The rotors were EDM-machined from solid 17-4 PH plate with the other internal components being machined from dual rated 316/316L stainless steel. The meter incorporated upstream flow conditioning tube bundles that can be removed as needed for meter servicing. The one-atmosphere electronics riser housing incorporates a custom designed electrical connector and the meter output is transmitted via a serial Modbus port to the main controller for the system.